Jonathon Cahn Harbinger of Discernment Gone Wild? 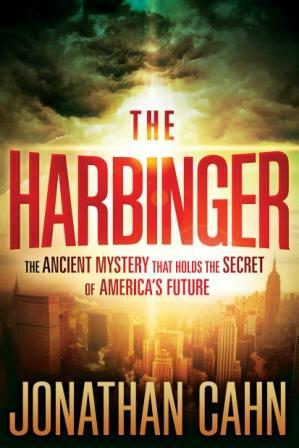 The Harbinger is a novel that is becoming very popular among both Christians and non-Christians, even reaching the top of the New York Times best-seller list at this writing. What makes it worthy of review, like other books that we have addressed, is that it offers an important opportunity for believers to exercise critical discernment. In this case, author Jonathan Cahn believes that he has discovered prophetic signs from God that are found in the Old Testament and directly apply to the United States, referring in particular to the events surrounding the terrorist attacks of September 11, 2001. Because The Harbinger ( TH ) is a fictional novel with a large dose of nonfiction added (Scripture), this critique involves two aspects: 1) a personal, subjective opinion, and 2) a more objective consideration of the author’s application of Scripture in his novel. Whenever we read a fictional story or see a movie, our evaluation is almost always subjective, e.g., what we like or don’t like about it. As the untutored art critic might say, “I don’t know anything about art, but I know what I like!” Even an art aficionado with some expertise rarely gets beyond the subjective, although he has a great deal more criteria than the everyday art lover for evaluating a work of art. In the end, it’s still just his opinion. In my opinion, The Harbinger is a poor script. I say “script” because it reads more like a script than like a novel, lacking nearly all of the elements that go into making a first-rate work of fiction. It tries to fit into the genre of National Treasure and The Da Vinci Code but fails miserably in my view—and I’m hardly an admirer of The Da Vinci Code. The redundancy throughout the book borders on being insufferable. If it were eliminated, TH could easily have been reduced to half its size. In addition, the dialog is repetitious, yet little if any insight into the story’s characters is provided, with the result that we don’t get to know them any better than we would a stranger whom we might sit next to on a three-minute subway ride. Good fiction has drama. TH reads like a nine-part seminar, ending with a two-chapter tract. I actually liked some aspects of the last two chapters (though I thought I’d never get there as I struggled through the previous ones). If there had been a clear gospel presentation, these chapters might have the basis for a good tract—but definitely not for a good fictional story. Again, these are simply my opinions. I have little doubt that some will disagree, especially those who are fans of the book. On the other hand, although TH is a fictional account that invites subjective criticism, it makes numerous claims regarding actual signs or harbingers from God—which it attempts to justify by supporting them with Scriptures. God’s Word, however, is not fiction. That subjects THto factual evaluation, because the Bible is God’s objective truth. Therefore, we can challenge Cahn’s claims objectively by searching the Scriptures to see if they indeed are true (Acts:17:11). As Isaiah wrote, “To the law and to the testimony: if they speak not according to [God’s] word, it is because there is no light in them” (Isaiah:8:20). Jesus reinforced Isaiah’s exhortation in His prayer for believers to His Father: “Sanctify [meaning ‘set them apart’]...through thy truth: thy word is truth” (John:17:17). The clarion call of The Harbinger , which seems to be quite sincere and is one with which all Christians might agree, is that the American people must repent of their evil ways and turn to God in truth. Amen to that! The major problem, however, is the way that the fictional story attempts to encourage such repentance. It declares that God has sent signs—nine harbingers—to the United States as a wake-up call that the country might take heed, repent, and thus ward off His impending judgment. If Cahn is mistaken about the harbingers and multitudes believe what he asserts, then he has led them astray. That is a serious issue and would identify him as a false teacher. Teaching God’s people wrongly carries a “greater condemnation” (James:3:1). The main characters in the story are a journalist and a mysterious prophet. The central contemporary event related to the harbingers is the September 11, 2001, attack on the World Trade Center in New York City. As the fictional story unfolds, it is revealed that the harbingers of warning and judgment are directly related to a prophecy found in the Book of Isaiah. Here is where the major thesis of the book fails the Prophet Isaiah’s own challenge of Isaiah:8:20: the author, Jonathan Cahn, has spoken “not according to [God’s] word” but has misapplied the scriptures in an attempt to support his own ideas throughout The Harbinger. Cahn gleans nearly all of his correlations connecting America with a prophecy made to Israel from one verse—Isaiah:9:10. To begin with, this verse applies only to the tribes of the Northern Kingdom of Israel, who, along with the Southern Kingdom of Judah, comprise God’s covenant people. All the way through TH , the United States is presented implicitly as a nation in covenant with God. No, God has only one covenant nation—the nation of Israel. This is a critical error of the book. Although that may be overlooked by someone eager to recognize the U.S. in Isaiah’s prophecy, one must read the entire context, which begins with verse 8 and runs through verse 21 of chapter 9.
is a prophecy of judgment of the most devastating kind. God declares that He will send Israel’s enemies to “devour” them (v. 12), destroying her corrupt leaders and lying prophets (vv. 15-16), and “for all this,” His anger would not subside, and in His wrath He would not show them mercy. The carnage would result in civil wars among the tribes of Israel—brother against brother—with utter destruction, starvation, cannibalism (vv. 19-20), and finally captivity by her enemy. Even so, “For all this his anger is not turned away, but his hand is stretched out [against Israel] still” (v. 21). No “warning” is even hinted at in these verses. Cahn’s isolation of Isaiah:9:10 and his symbolic interpretation of that verse to make it fit the September 11, 2001, jihadist attack on the U.S. is preposterous. (It’s also very odd that nowhere in the book is Islam or the term “Muslim” mentioned.) Nevertheless, as tragic as 9/11 was, what reasonably discerning person would see this as comparable to Isaiah’s account of God’s judgment on the Northern Kingdom of Israel? Furthermore, even a cursory review of American history will bring to mind far more devastating events than 9/11, from Washington, D.C. being burned and sacked in the War of 1812, to the Civil War, to Pearl Harbor, to the debacle in Vietnam, etc. Ignoring such events, Cahn zeroes in on the devastation of “Ground Zero” as verification that God has removed His “hedge of protection” from the United States. How Cahn decides what events of contemporary history God is using for His very specific purposes is troubling. Are they Cahn’s own prophetic insights or just his speculations? If the former, he is on very tenuous ground. For many, selectivity on Cahn’s part creates some of the most compelling assertions in the novel. Again and again, as G. Richard Fisher of Personal Freedom Outreach has noted, “Cahn is playing on the old mistake of saying [that] similarity means identity.” The nine harbingers are selectively (and erroneously) taken from Scripture and are then given life by the comparison to similar things surrounding 9/11, which are then identified with Isaiah:9:10. That’s the faulty method. Fisher explains, “Similarity is not identity. A $100 bill is similar to monopoly money, which is paper, has numbers on it, and is referred to as money.” To attempt to tie them together beyond that similarity, like paying a bill with monopoly money, will have embarrassing consequences at least. Isaiah:9:10 cannot be identified with America and 9/11, and that’s all one has to understand in order to reject Cahn’s book. Yet, for those enamored with The Harbinger and still not convinced of its serious biblical problems, consider a few of the harbingers themselves (there’s not enough space here to evaluate all of them). The sycamore and cedar trees are mentioned in Isaiah:9:10: “The bricks are fallen down, but we will build with hewn stones: the sycamores are cut down, but we will change them into cedars.” The passage uses sycamores as a metaphor for weaker trees being replaced by stronger, taller cedars in an act of arrogant defiance by the Israelites, who will not submit to God. Cahn points to a singular sycamore and what he refers to as a type of cedar tree (actually a Norway Spruce) that replaced it at Ground Zero as harbingers connected to Isaiah:9:10. Although there is a similarity , it takes a great deal of subjective wrangling by Cahn in his attempt to make it match Isaiah’s prophecy. The context does not allow Cahn’s claims. There are numerous other problems with the harbingers, even though they are constructed subjectively and selectively by Cahn. Granted, the author does raise an intriguing date phenomenon related to the economic misfortunes connected with 9/11 when he attempts to link the Jewish shemitah , the Torah law of letting the land lie fallow and the forgiving of debts in the seventh year of a seven-year cycle, as a warning to the U.S. No matter what one conjectures regarding the significance of a stock market crash occurring on the first day of shemitah, the shemitah itself has no bearing on anyone or anything other than the nation of Israel. It has never applied to the Gentile nations, either in actual practice or figuratively in Scripture. To superimpose a connection with America is just that—a superimposition. Another imposition from Cahn’s imagination is his suggestion that the inauguration of George Washington in New York City was a “consecration” of America to God similar to Solomon’s consecration of the Temple in Jerusalem. To even compare the two verges on blasphemy, especially because history reveals that much Masonic ritual was involved, as well as the “works-salvation” doctrine of Masonry contained in Washington’s speech. It was more suitable to the god of the Masonic Lodge, the Great Architect of the Universe, than to the God of Abraham, Isaac, and Jacob—the God of the Bible. Part of the dilemma in criticizing The Harbinger is that if the foundational error in it is not acknowledged (that America has some sort of covenant with God, and that there is a direct biblical correlation between Israel and the U.S. in the events of 9/11 and following), that opens the door for the acceptance of the book’s many fallacious ideas. This creates a perception of “credibility” simply by entering into a dispute over them. Even so, because most of them are so obviously wrong, pointing any one of them out to someone enthralled with the book may still be helpful. Some of these things are addressed in other parts of this newsletter and will be touched on in our future issues as questions arise.